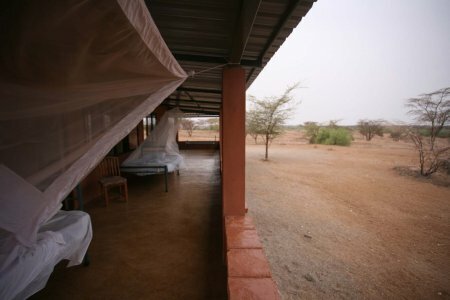 Turkana Basin Institute students, faculty and staff were astonished on Wednesday when a vigorous windstorm gave way to rain. The whole ecosystem of the Turkana desert, from the smallest insects and algae to the fish, birds and great acacias depend upon annual rains. A drought has devastated the region for over 2 years now, and all so work stopped when the first droplets began to fall. 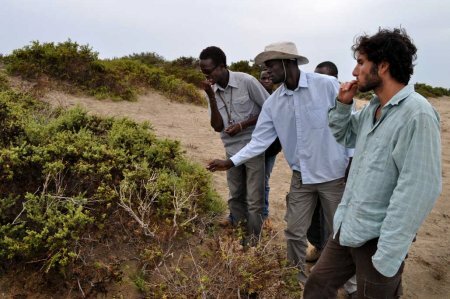 After waiting for the rain to subside, Dino Martins led TBI Field School students to the Kerio River Delta, which has suffered a dramatic ecological reorganization following the invasion of the plant Prosopis juliflora. 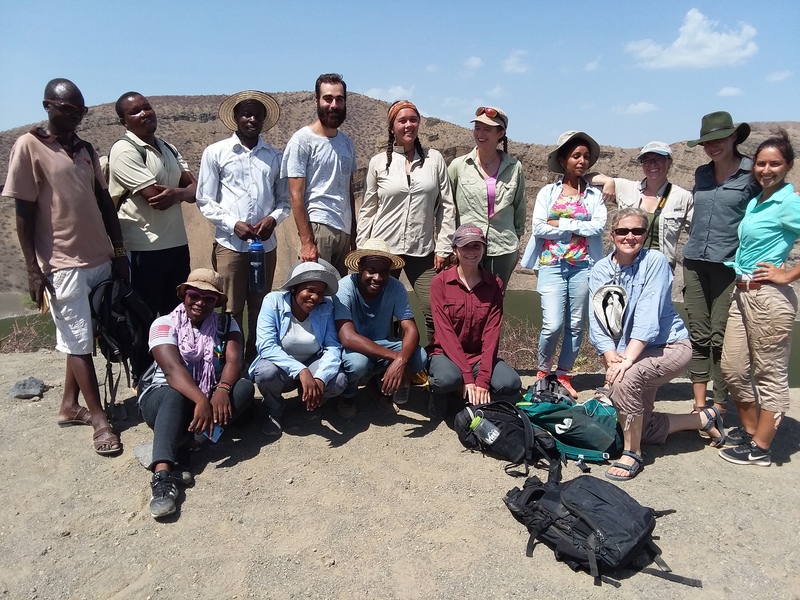 Students collected insects to measure the health of the local ecosystem, and lastly ended their day by traveling into the wetlands joining the Kerio Delta with Lake Turkana. 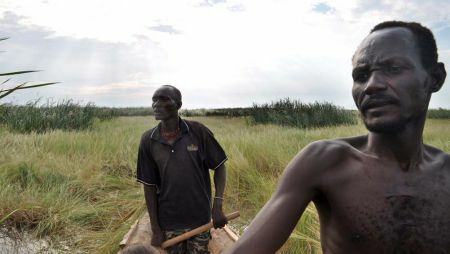 Turkana fishermen navigate the Kerio River Delta and Wetlands. After a long night of howling wind, rattling windows and billows of desert dust, heavy clouds brought rain on Wednesday morning, for the first time in almost a year. 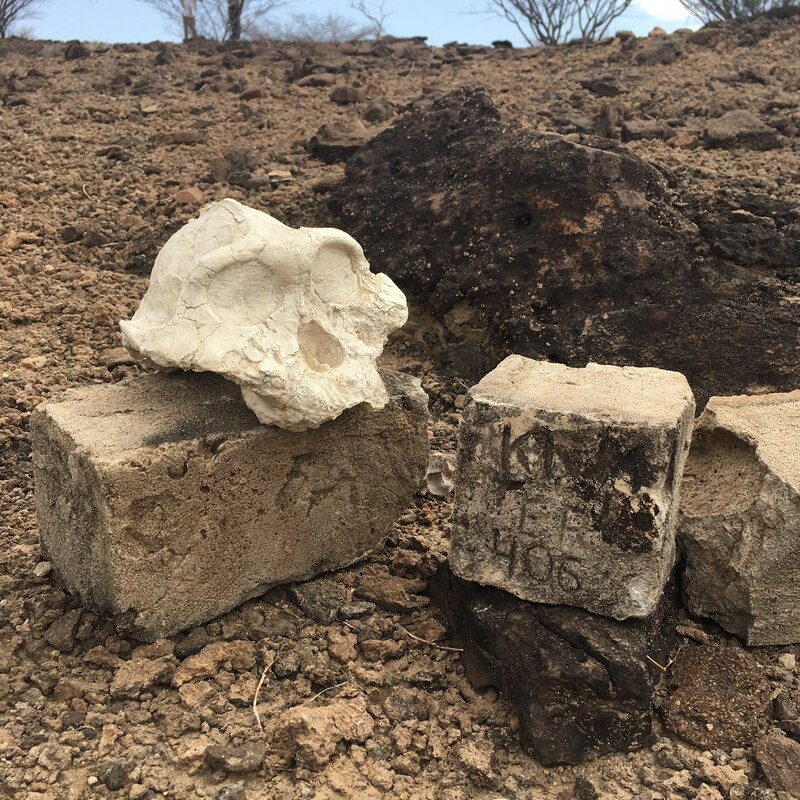 A drought has settled in Turkana for over two years now, straining local ecosystems, devastating livestock and forcing hardship on many Turkana people. 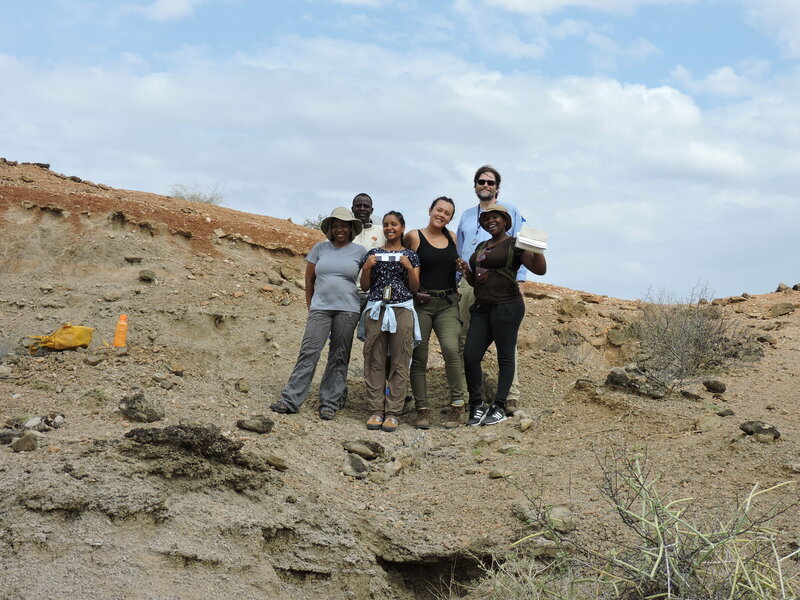 After the rains Dino Martins led students to the Kerio River Delta, a important source of water south of TBI and tributary to Lake Turkana. Once home to a great diversity of Acacia, Palm and Cordia trees, the Kerio Delta has been inundated in recent decades by the invasive Prosopis juliflora, a native of South America. NGOs introduced the plant in past decades hoping that it would help local people cope with deforestation, famine and erosion. Local ecosystems, already damaged by years of overgrazing, deforestation and climatically influenced droughts, were overwhelmed by Prosopis and and are now being overrun. The plant is unhelpful as a source of fodder or charcoal, and has formed a riparian monoculture that is depleting groundwater and lake levels. 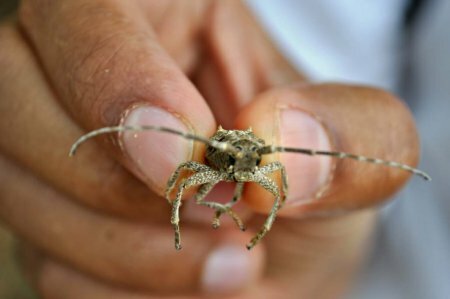 By measuring insect diversity and abundance in the Prosopis woodlands, TBI students contributed to a project hoping to better understand how the invasive interacts with and either supports, or compromises the health of local fauna. 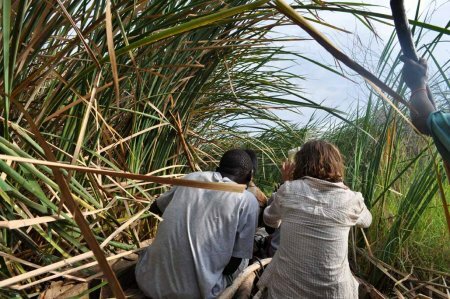 Following data collection, students were taken by local fishermen to see firsthand the encroachment of Prosopis on the wetlands of the delta. Wind and rain blow into the bungalows at TBI. Students and staff pulled their beds back from the verandas to keep them from getting wet. Mike, Ekamis, John and Etabo take shelter from the rain. 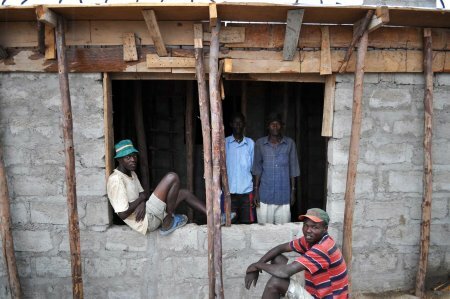 Every day, TBI workers continue their construction of new laboratory facilities under a merciless Turkana sun. 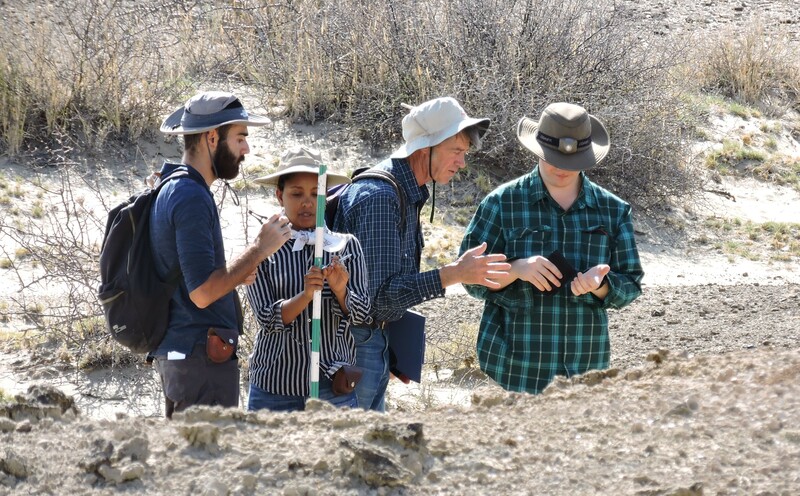 Their efforts will help establish a major ecological and paleological research facility, hosting more advanced equipment, more students and staff, and experts from around the world. Erupe and Konyen enjoy the rain. 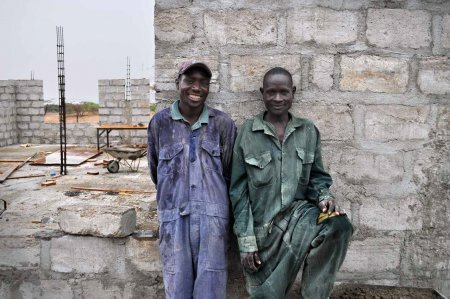 Erupe and Konyen, who operate the concrete mixer, enjoy a brief respite from the heat as rains break the drought in Turkana. Raymonde Bonnefille shows students her photos from Aramis. 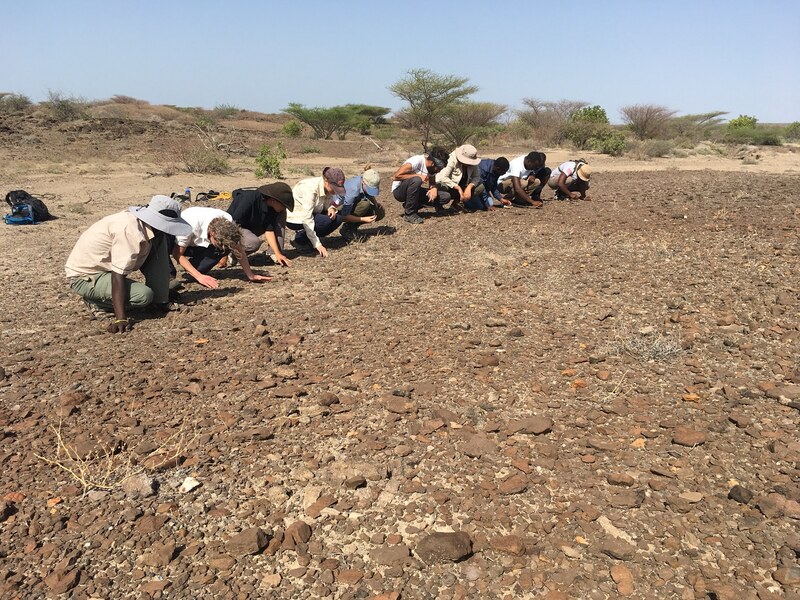 Professor Raymonde Bonnefille arrived this week and will soon begin a series of lectures and field excursions helping TBI students explore the paleoecology of the Turkana Basin. 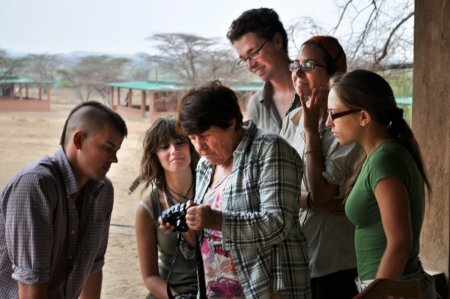 Raymonde has worked throughout the African Rift Valley, and above she shows students photographs from her work at Aramis, a critical site of human evolution in the Ethiopian rift. 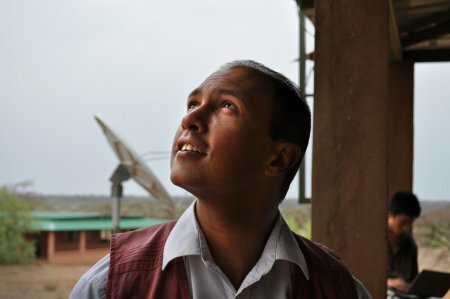 Dino Martins looks up at the rain. Dino has spent years studying the complex web of interactions that unite insects, plants, birds and even humans within the greater ecosystem. Rains in Turkana produce an immediate response from all creatures. Even as Dino spoke, Ant and Bee queens raced into the air, some traveling over a mile upwards, in order to mate with males and form new colonies. Hatching insects everywhere feed on nectar and pollen from flowering grasses, shrubs, bushes and trees, who while providing these insects with food are then pollinated and bear fruit. Luke, David and Wyatt taste the leaves of a saltbush. Some areas of the desert remain as yet resilient against invasion by Prosopis. Above, the saltbrush Suedea caps the dry dunes of the Turkana desert, keeping within their boundaries a unique ecosystem for which they provide energy from the sun. 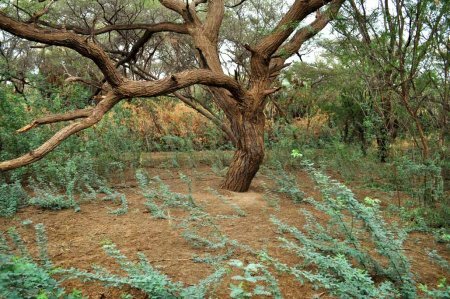 A dying Acacia tortilis surrounded by Prosopis saplings. 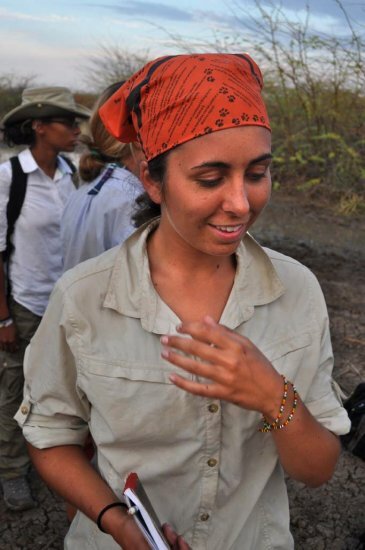 Traveling to the Kerio River Delta, students encountered more and more Prosopis until it was the only species present, therefore forming a monoculture. All over the world, individual plant species are able to support numerous, and sometimes dozens of specially adapted insect species; Acacias will over host a great diversity of ants who protect them from browsing herbivores in exchange for a home, and food. The spread of an invasive monoculture may have disastrous effects upon native communities of insects, and other plants or animals that rely upon them or food or pollination. Dino finds a Long-Horned Beetle. The larvae of these Long-Horned Beetles are stem borers, typically making homes in acacia trees. We hope this one is able to live in Prosopis. Luke, Meadow and Kelly catch insects on the Kerio riverbed. The Kerio River is ephemeral, flowing only a few monts of each year. Otherwise, the river forms a wide and flat bed draped in dry clay. In the distance, walls of Prosopis can be seen lining the river banks. TBI students and Turkana children walking beneath solid walls of Prosopis. Local Turkana showed Dino and TBI students a wild honeybee colony, growing in the dead trunk of an old Acacia tortilis. Honeybees will pollinate hundreds of surrounding plant species, ensuring their survival and continued health, and protecting other species including humans who, in turn, rely upon the plants. In sub-Saharan Africa, as elsewhere, honeybee populations have been crashing through a combination of habitat destruction and pesticide poisoning. Many highly toxic pesticides, banned in the United States and Europe, are sold at low rates throughout Africa, causing unknown harm to animals and people ingesting poisoned food, or drinking poisoned water. Dino encouraged local people to manage the wild honeybee nest rather than simply harvesting it, as a method of promoting ecosystem health. Debbie, Sonia and others struggle through a muddy break in the Prosopis cover. After insect collection and identification, fishermen led TBI students through the Prosopis-infested delta towards the wetlands adjacent to Lake Turkana. Local fishermen have asked TBI to help manage the Prosopis woodlands, which are encroaching upon lake margin ecosystems critical to lake fisheries and their own livelihoods. 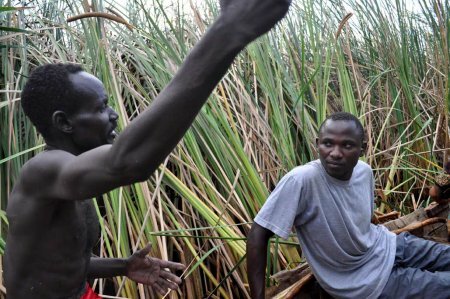 Johnpius and Meadow duck beneath bullrushes as fishermen take them through the delta. The wetlands were densely packed with a beautiful array of grasses, bullrushes and cat-tails, and all manner of birds. Fishermen look for a passage through the Kerio River Delta and into Lake Turkana. Approaching Lake Turkana, the route became increasingly difficult. A fisherman explains the meaning of his song to Johnpius. Turkana fishermen sing a song while rowing, especially when their work is strenuous or the waters are treacherous. Above, a fisherman explains that in their song, God protects them as the waves rock their small boats too and fro across the waters. Mandy holds up the empty nest of a Weaver Bird. Students found many old weaver bird nests within the reeds. Chelsea after returning from the boat ride. 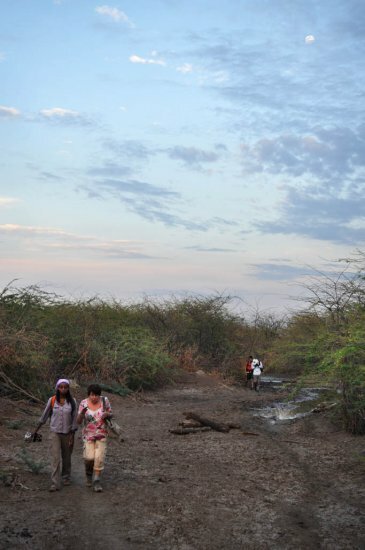 Veronica and Raymonde walk back from the Kerio River Delta through Prosopis brushland. 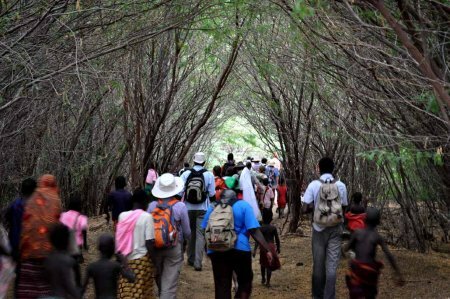 Traveling into the Prosopis woodlands, students witnessed firsthand the devastating effects brought about by invasive species, affecting not only other plants and animals, but also people and their way of life. Ecosystems are naturally resilient, and Dino Martins’ research has helped show that species invasions typically afflict unhealthy ecosystems, severely weakened or disturbed by human activity. Would Prosopis have been able to wholly replace native species of trees and shrubs before they were cleared, burned and grazed? These natural systems are complex, and the ecological research at TBI hopes to provide scientists and local people with an understanding of local ecosystem dynamics. Continued collaboration between the Turkana and TBI will be important to protecting the natural environment of the Turkana Basin, and providing for Turkana communities that rely upon them.